•Raising awareness among managers, owners, investors, with targeted information and material on the opportunity to improve efficiency. •Providing an open process and forum for discussion representing European stakeholder requirements. •Creating and providing an enabling tool for industry to implement cost-effective energy saving opportunities develop a set of easily understood metrics to measure the current efficiencies and improvement. •Producing a common set of principles in harmonisation with other international initiatives. Dr. Paolo Bertoldi is Principal Administrator at the European Commission Directorate General Joint Research Centre, Ispra, Italy, where he manages research activities for energy efficiency policy, the efficient use of electricity, and innovative policy instruments, e.g., white certificates, financing mechanisms, emission trading. He is also in charge of negotiated and long-term agreements with industry and tertiary sectors and the GreenLight, Motor Challenge, and Standby Initiative programs on behalf of the Directorate General Energy and Transport (DG TREN). 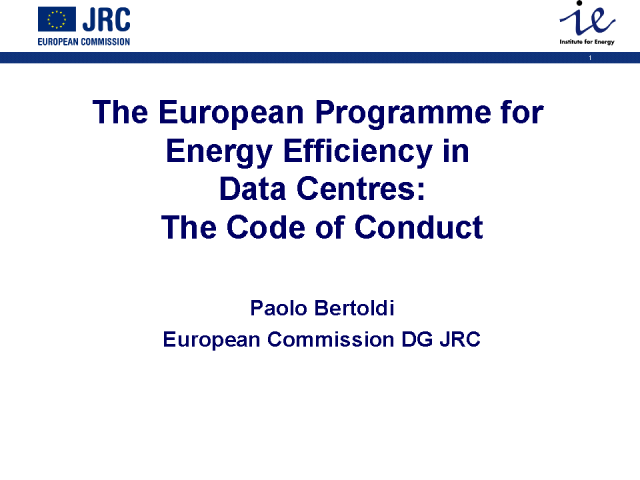 Previously Dr. Bertoldi was Administrator with the European Commission, DG TREN, Brussels, Belgium, in charge of European Union (EU) regulatory and voluntary programs for the rational use of energy in end-use equipment, buildings and industry. Dr. Bertoldi also worked in the EU nuclear fusion project, Joint Undertaking Torus (JET) in the United Kingdom. Dr. Bertoldi holds a Doctorate in Electrical Engineering from the University of Padova (Italy).